Tchaikovsky (1840-1893) was a prolific composer: ballet scores, e.g. Swan Lake and The Nutcracker, concerti for the violin and piano, six symphonies and other orchestral works. He wrote songs, instrumental music and opera, the best known of which is Eugene Onegin. He was a troubled man from a young age until his death. Whether he died from natural causes or suicide remains a point of conjecture. He wrote music of passion and deep emotion, but by no means all melancholic. Music, it’s good for the soul. The original version of Legend (Легенда) (also known as Crown of Roses), which we will be singing on Saturday, appeared first in Tchaikovsky’s 1882 collection, 16 Songs for Children. He arranged it for SATB chorus in 1889. The words tell a legendary story of children meeting with Jesus. The verses foreshadow the Easter story, yet the piece is often sung at Christmas, perhaps because it begins “When Jesus Christ was yet a child”. This is the final Simply Romantic blog post before the day itself, but you might like to take a look at these videos in the meantime. See you all on Saturday, we’re looking forward to it. 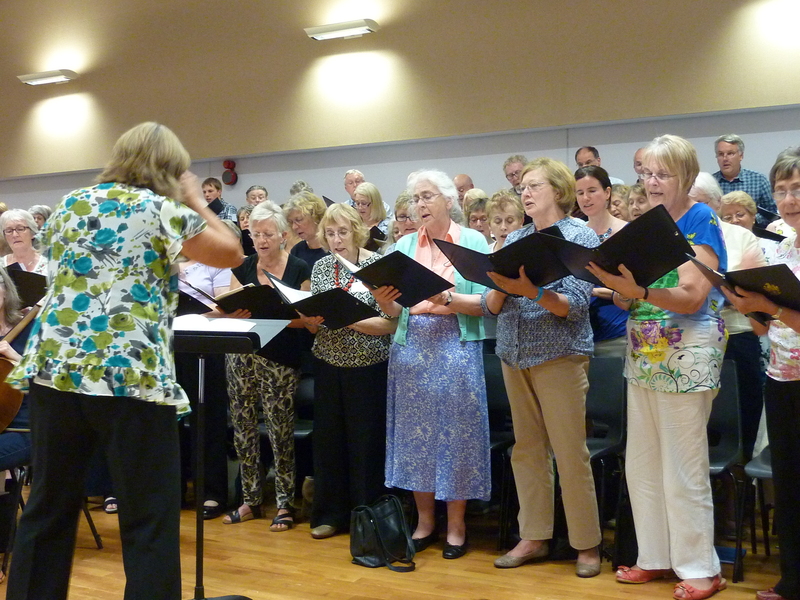 There will be a review entry of the day itself and then news about the East of England Singers’ concert on the 17th of October at St John’s, Carrington – Purcell, Mozart, Bruckner and Stravinsky. Voices, drums, woodwind and brass. Not to be missed! For a change of mood and style, let’s go to the opera. Alexander Borodin was a doctor and chemistry professor at the St Petersburg Academy of Medicine. This left him with little time for composition, and though he worked on his vibrant opera, Prince Igor, for 18 years, he was unable to complete it before his death in 1887, aged 54. Thankfully, his composer friends Rimsky-Korsakov and Glazunov set to work on Borodin’s manuscript. From the LBSO programme notes: Prince Igor is based on a Russian epic from the twelfth century. It recounts the story of the heroic Russian warrior, Prince Igor, who goes to war with the Polovtsi, a Tatar warrior tribe. When a sudden eclipse of the sun foreshadows the defeat of Igor’s army, the Prince is captured by the Polovtsi’s Khan, who attempts to seduce Igor into joining forces with him by means of the sensuous dancing of the Polovtsian slave maidens. Igor, however, manages to escape and rejoin his faithful wife. We’ll be singing two choruses from the Act that includes the Polovtsian slaves – so up to 5mins 45seconds in the video, but enjoy the rest if you have time to. Might there be dancing on Saturday? Who knows! Simply Romantic – Rachmaninov or Rachmaninoff? Sergey or Sergei? Rachmaninov or Rachmaninoff? The information suggests his family, part of the Russian pre-revolution bourgeoise, spelled their surname the first way originally but changed it on leaving Russia for the West in 1917. Having lost everything in the revolution, Sergei, his wife and children, travelled to Sweden by open sled. He took with him just a few notebooks containing sketches of his compositions. Though born in Russia in 1873, he died in Beverley Hills in 1943 having become an American citizen only a few weeks earlier. Thankfully he had travelled to Europe and the States to perform and conduct whilst still living in Russia, so he found a welcome (and the gift of a Steinway grand piano) awaiting him abroad. 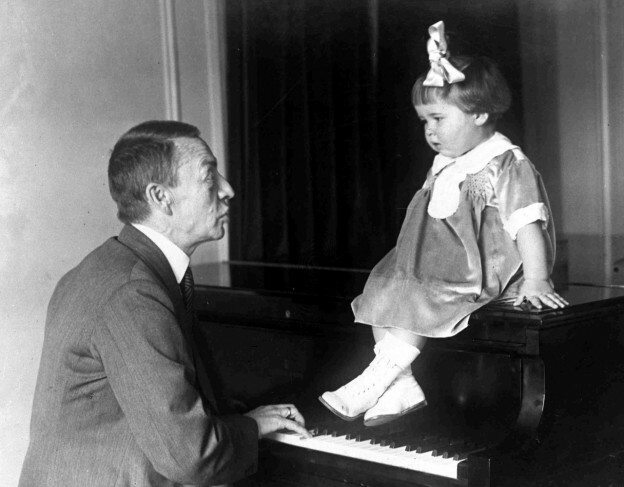 Rachmaninoff was a highly talented pianist and composer. His hands were so large he could play, with one hand, chords that spanned 12 white piano keys. The photo, from AP Photo, shows him playing for his granddaughter, Sophie, in 1927. Well, a variety of pieces including Dvořák’s Kyrie from his Mass in D major, Rachmaninoff’s Ave Maria, Tchaikovsky’s Legend, Mendelssohn’s Grant us thy Peace and opera choruses, including extracts from Borodin’s Prince Igor. 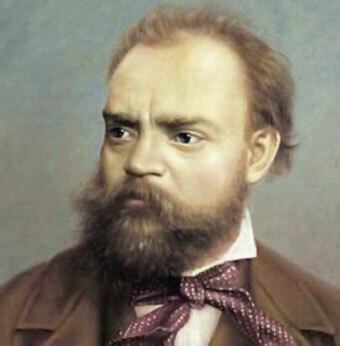 Although Dvořák learnt to play the piano and violin (later viola) at an early age, the organ became his main instrument of study. As he built his career in music, he played his various instruments in restaurants and churches, at balls, for theatres, the opera and concerts – everything from folk music to classical. By the late 1870s he was earning enough from prizes and commissions to devote more time to composition than to playing and teaching. YouTube is a great source of performances, some with video, some without. Some good, some not so good. They can be useful when learning a piece or just to sing along with for the fun of it. First up, Dvořák’s Kyrie. The first adult workshop event is Simply Romantic on Saturday 3rd October at the Bluecoat Academy, Aspley Lane, Nottingham. It’s a day of singing just for the joy of it, no concert. We’ll be writing a few blog posts before then to introduce you to the rich variety of pieces Angela and Alex will be exploring with the singers during the workshop. Now we hope this doesn’t come as a disappointment, but when we say Romantic music we don’t mean we’ll be singing love songs all day, rather music by composers from the Romantic era of Western classical music. This pretty much encompassed the 19th century and gave rise to music full of emotion and passion, often rich in melody. (We like a good tune.) Old forms were discarded or modified and new ones created. More percussion instruments were added to orchestras, rhythms and variation in time signatures became more adventurous, as did changes of key and harmonies. So who are the famous composers of the Romantic era? Brahms, Tchaikovsky, Rachmaninoff, Mendelssohn, Dvorak, Berlioz, Chopin, Schumann, Bruckner, Lizst, Borodin and Wagner to name but a few. Click here to book for the Simply Romantic workshop. While you’re on the site, take a look at all the music making opportunities for 2105/16. There are new groups for adult instrumentalists, and plenty going on for music makers of all ages.